We haven’t a had Moonlight mass cycle for a while and I wasn’t sure who was going to come. It was a Monday night with school the next day . I was pleasantly surprised by the great turn-out . The many children and their parents. Lights were fitted , helmets clipped on and away we went . We followed the brick cycle path and had plenty of support along the way. Our local security company Allsound assisted at road crossings and kept a eye on us along the route. Super guys. Such was the excitement , that the shorter ride planned for the smaller kids didn’t happen – they all wanted to go the whole way !! The moon only rose after the ride had finished , but this did not dampen the spirits at all . We all got to see the Super moon rise – a little later at least. We asked that everyone bring a toy or stationary for the Knysna Education Trust (for all the creches they support ) and people were super generous.Thank-you to all who were there. 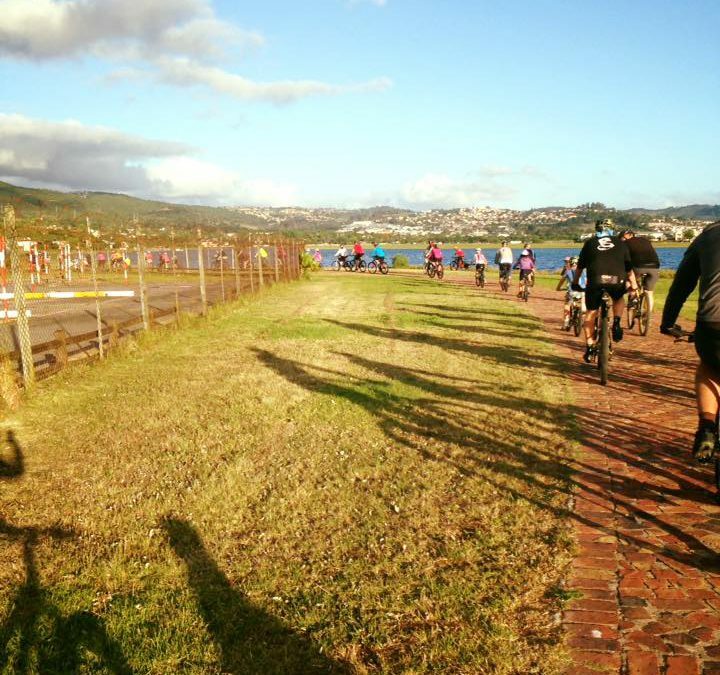 Next time , as it in the school holidays the #knysnamoonlightmass will begin at 7pm to witness the moonrise on the ride. It is going to grow bigger and bigger and I am looking forward to all the enthusiastic kids and parents who will join us.I want to see who can decorate their bike with as much festive bling as possible. There will be a prize for best dressed bike !! I would like to continue supporting the KET and have found out that any stationary or educational material suitable for pre-schoolers is always welcome. See you 14 December at the #knysnamoonlightmass.